Giurgiu ([ˈd͡ʒjurd͡ʒju]) is a city in southern Romania. The seat of Giurgiu County, it lies in the historical region of Muntenia. 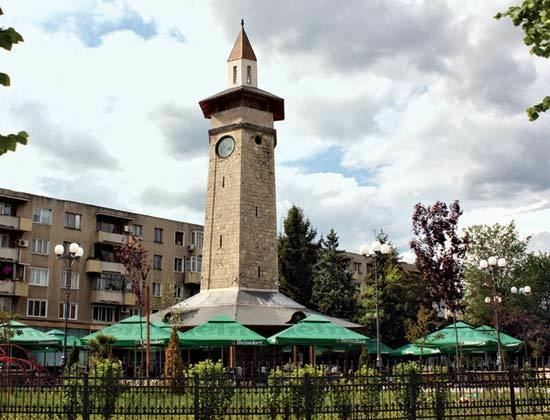 It is situated amid mud-flats and marshes on the left bank of the Danube facing the Bulgarian city of Ruse on the opposite bank. Three small islands face the city, and a larger one shelters its port, Smarda. The rich grain-growing land to the north is traversed by a railway to Bucharest, the first line opened in Romania, which was built in 1869 and afterwards extended to Smarda. Giurgiu exports timber, grain, salt and petroleum, and imports coal, iron, and textiles. The Giurgiu-Ruse Friendship Bridge, in the shared Bulgarian-Romanian section of the Danube, crosses the river in the outskirts of the city. The area around Giurgiu was densely populated at the time of the Dacians (1st century BC) as archeological evidence shows, and Burebista's capital was in this area (it is thought to be in Popeşti on the Argeş River). During Roman times this was the site of Theodorapolis, a city built by the Roman emperor Justinian (483-565). The city of Giurgiu was probably established in the 14th century as a port on the Danube by the Genoese merchant adventurers, who established a bank and traded in silks and velvets. One theory is that they called the city after the patron saint of Genoa, San Giorgio (St George), however Nicolae Iorga disputes this theory, arguing that Giurgiu is just an old Romanian form of George. It was first mentioned in Codex Latinus Parisinus in 1395, during the reign of Mircea I of Wallachia, and was conquered by the Ottomans in 1420 as a way to control the Danube traffic. The Ottomans named the city Yergöğü, as if from yer 'earth' + gök 'sky,' but the name was probably given because of the similarity between the pronunciations of "(San) Giorgio" and "Yergöğü". As a fortified city, Giurgiu figured often in the wars for the conquest of the lower Danube. It was the site of the October 1595 Battle of Giurgiu, and figured in the struggle of Michael the Brave (1593–1601) against the Turks and in the later Russo-Turkish War (1787-1792). It was burned in 1659. In 1829, its fortifications were finally razed, the only defence left being a castle on the island of Slobozia, connected to the shore by a bridge. In 1952–1954, during the Communist regime, the USSR helped build the bridge between Giurgiu and Ruse, The Friendship Bridge, a bridge on the Danube linking Romania and Bulgaria. According to the 2011 census, Giurgiu has a population of 54,655.